Xochiquetzal - Goddess of fertility. - Aztec Goddess. Xochiquetzal is a Goddess of fertility beauty and female sexual power. 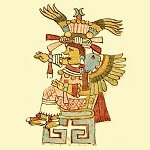 Home ¦ Divinity of the Day ¦ Aztec Gods and Goddesses ¦ Xochiquetzal - Goddess of fertility. Xochiquetzal - Goddess of fertility. Xochiquetzal is a Goddess of fertility, beauty, and female sexual power. She is a protector of young mothers and a patroness of pregnancy, childbirth, and the crafts practised by women such as weaving and embroidery.